The National Institute of Standards and Technology (NIST) is racing the clock to whip into shape the comprehensive cybersecurity framework mandated by President Obama's February executive order. As my most recent piece for CSO Magazine highlights, critical infrastructure providers say there is a lot of work to get done before the framework, a first-time government effort to bolster better cybersecurity across all critical infrastructure, is published in the Federal Register on October 10 and put out for public comment. 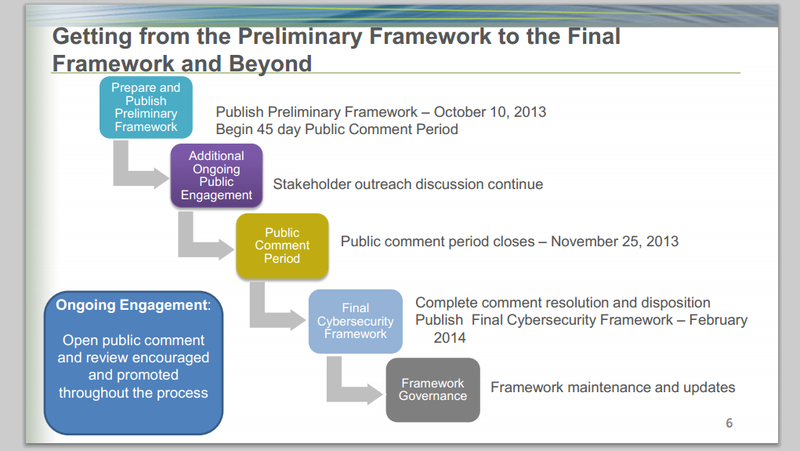 The final framework is due in February, but when it comes to the constantly changing world of cybersecurity, the framework could keep evolving indefinitely. As Patrick Gallagher, the head of NIST, saiid, "in my view the framework is never finished."